Learn more about how the Ayoreo people living in voluntary isolation are trying to protect their Ayoreo ICCA. 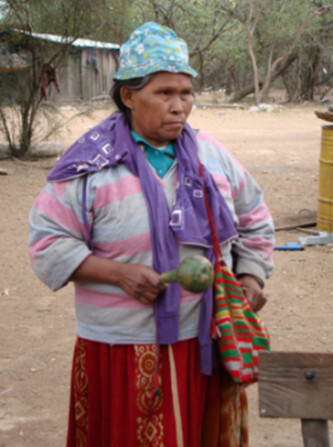 Today the Ayoreo are being increasinlgy forced to leave their ancestral territories (ICCAs). Currently their territory – particularly within the Paraguayan region – is being deforested at an alarming rate in order to clear land for cattle ranching and other commercial agriculture and vegetable oil production. Traditional Ayoreo Territory covers over 30 Million hectares between Paraguay and Bolivia in the Amazon basin. The Ayoreo live in the dense, semiarid bush and forests of the Chaco Region which covers most of the northern portion of the Gran Chaco region of South America, bordered by the Paraguay, Pilcomayo, Parapetí and Río Grande Rivers. Cattle ranches pose the greatest threat to the livelihoods of the Ayoreo, as most deforestation occurs in order to expand existing ranches and develop new ones. Ayoreo community members themselves created ‘The Ayoreo Photo-Story’ (a Consortium sponsored Initiative). It captures, from the Ayoreo perspective, the reality of the situation their Ayoreo brothers and sisters still living in voluntary isolation are facing. An ‘Introduction to the Ayoreo Photo-Story’ provides a brief introduction whilst the ‘Ayoreo Synthesis Report‘ describes in greater detail the Internal and External threats facing one particular Ayoreo community. The report is based upon an ICCA Resilience and Security Tool: an ICCA Consortium initiative currently being tried-out throughout the world helping Indigenous Peoples and Local Communities assess the internal and external threats to their ICCAs according to social, geographical, environmental and political factors. A ‘completed Ayoreo Resilience and Security Tool’ has also been completed by Ayoreo community members.